Through my work as a screenwriter I ended up in Italy at some stage. From the Netherlands a course week was organised for writers and directors at one of the best-known screenwriters in Italy, Tonino Guerra. (He worked with Fellini, Taviani brothers and is still active in film and poetry). Tonino Guerra showed me how in his country, culture and nature can be in harmony. This was my first encounter with Italy. I already had been backpacking often, notably in Britain, but also many day trips in the Ardennes, Germany and Portugal. Italy was unknown to me. Since I now was in Pennabilli anyway, I decided to walk into this unknown territory for me. There was only sparse, relatively inaccurate (mainly Italian) information about the areas I hiked through. Proved impossible to find good maps. But I did discover how varied and beautiful Italian nature is. Therefore, it surprised me that I did not see any tourists in the famous Tuscany and Umbria. Other travel companies I had worked for as a travel rep in Umbria were only using the real well-known trails. After I finally got a good taste for Italy I worded some years on a small farm campsite in Tuscany. Also in this area, with so much variety in culture and history, there was hardly a walking culture. And there still are no proper walking maps of the area. Italians hardly walk themselves and therefore the tourist maps they sometimes make are not detailed enough to be useful. Moreover, they often copy the mistakes of older cards. Incorrect contour lines, paths that do not exist or incorrectly described ... I also discovered what Italians consider beautiful paths: tarmac! However much I told them that that was not what I was looking for! Because of those bad maps and also because I wanted to avoid tarmac, I always got lost. But I discovered the most beautiful trails and got to know the people of the area very well. I decided to put together a trail of the impressive nature walks through various authentic hamlets that I had discovered over the years. Such a trail would have to appeal to novice and experienced hikers. A good structure in the program was important to me, because if you want to learn riding a bicycle, you do not start at a steep mountain in the Alps. Also I did not want to walk in large groups. So everybody can experience this area from their own view points and interests. Also I did not want to provide a complete package holiday. That way everyone is free to choose how they want to travel, with whom and where you want to eat. This way you also can easily fit my walking program into a longer holiday. Mostly I walk in the spring because this is the best time and it still is not too hot. Because of my knowledge of the area I supervise my own trips. It bothered me with other travel companies that I often had to accompany groups into unknown territory, without an opportunity to explore it myself beforehand! 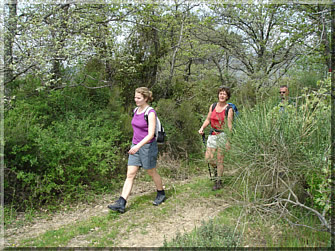 Since 1995 I have been guiding my own walking groups and get enthusiastic responses. I considered it a compliment when two participants who walked along two consecutive years announced they want to come again! "Is not that boring?" I asked them (although I found it very exciting that they wanted to join again!). "No," was the reply, "you always tell different things because of the different interest. Rust in the group and we always see new things. And although we can read the map, we still are not able to find these tracks! Moreover, you yourself still find these walks interesting, right? " And that's true! I still have new things to explore in this area that has so much history and where nature is never the same. It was exciting to hear how what experienced hikers thought of my programme. There were two people who had walked from the Netherlands to Compostella and where now exploring his area for three weeks. They camped on the site and the last week of their stay, they came along for the waaks. They told me I had to put in my leaflet: "You really get a lot more than you expect!" The walks are structured in a way that good beginners can easily do them, that is if at home you are already able to make four or five hours to walk along the beach. And if five days walking is a little too heavy, then there is the possibility to do something else for a day or to just do half the trek on the last day for example. The participants are from all age groups. They are often people who do not like large groups do not want to be forced to deal with each other from morning until late at night. There are also participants who normally do not go on organised holidays but find this a good opportunity to take advantage of the knowledge that is already there, so they do not have to go rambling randomly by themselves. As Lucia Tours want to work with small groups and wants to keep the price low is, Lucia Tours limits marketing expenses. Therefore we hope that not only participants but also the readers of this homepage will spread the word! Perhaps, see you (again) in Italy.